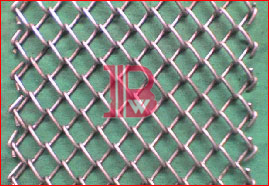 This weave is frequently used for chain drive belting and also used for guards on machinery as well as protective barriers. The mesh of this belt is very large or small openings. 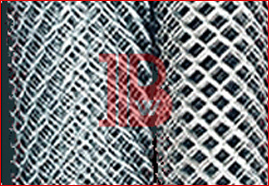 Chain Link Type Conveyor Belts are frequently used for chain drive belting and also used for guards on machinery as well as protective barriers. The mesh of this belt is very large or small openings. The chain driven belt conveyor is almost the ultimate in traction and power, equaled only by the Plate Link or Slat conveyor types. It is the belt equivalent of the Chain Driven Roller Conveyor. In the Chain driven conveyor the belt is bolted to a series of cross-members, the ends of which connects to chains running down each side of the conveyor. The chains connect to the motor via a sprocket. This produces a high degree of linkage between the belt and the motor, making slippage impossible. This technique is usually associated with very large conveyors, such as the waste recycling conveyor pictured here. However, the same technique can be scaled down for smaller conveyors. The system still uses a rubber belt, so it is potentially vulnerable to sharp or abrasive loads that can puncture or cut it. For such types of load, the Plate Link Conveyor might be a more suitable choice. However, the belt is very easy to repair, as each section between consecutive cross-members can be replaced independently of the rest of the belt. The belt also has an advantage over the plate link conveyor in that the carrying surface is flexible. If a large, heavy load is ‘dumped’ from a height onto the conveyor, the belt will flex and absorb the impact. 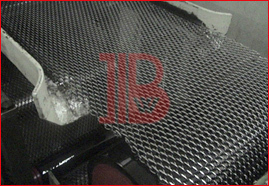 The same load violently dumped onto a plate link conveyor could dent one of the rigid plates.